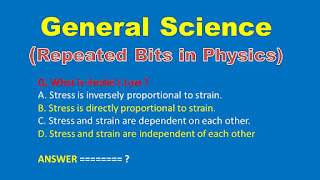 Railway Important repeated bits in Physics: General Science is the important topic for the all competitive exams like as SSC CGL, SSC CHSL and Railway, RRB NTPC Exams. Below we give the Chemistry Objective Questions with Answers useful for who are preparing for the Railway Recruitment Board Examinations like as Railway Group D, ALP and other examinations. Q. 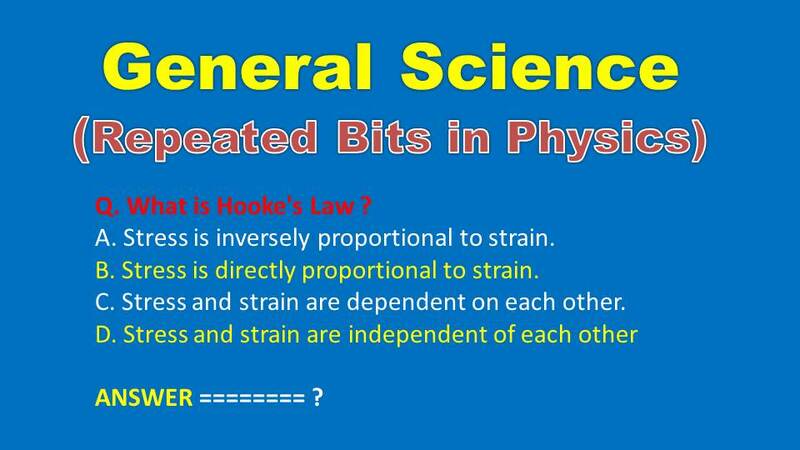 What is Hooke's Law? A. Stress is inversely proportional to strain. B. Stress is directly proportional to strain. C. Stress and strain are dependent on each other. D. Stress and strain are independent of each other. Q. Which of the following is an electromagnetic wave? Q. Which instrument is used to measure sound under water? Q. Who among the following gave the first experimental value of G? Q. Which of the following is not the unit of time?